As the title suggest. 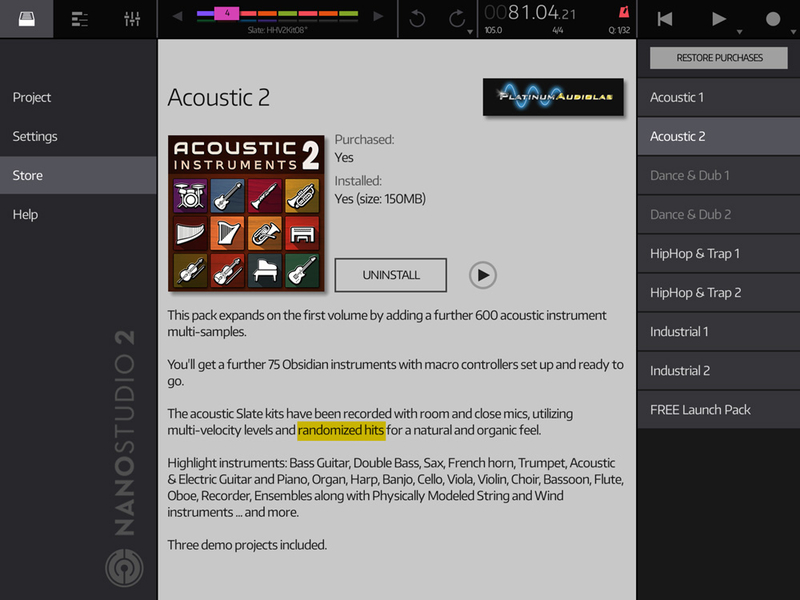 I believe the functionality is already there, since apparently some of the IAPs make use of round robin samples, so it would be nice if that option also existed for user-created instruments. No true round robin for sample playback at the moment. whops, then there is probably something what i don't know )) @StevePAL then this is probably question to you. In Obsidian modulation matrix.. choose "Source > Key" .. you see there mod sources "Rand 1" and "Rand 2" - those are basically random number generators, with every voice played they genreate random number based on mod amout - eg if you set for example "50" , it means any modulation you us is for each voice applied with different amount from rande 0 - 50.
random sample start - same concept as free runing oscilaltors, just apply "Rand1 > Sample start"
So - it's not Round roubin, even not workaround, but tool for adding randomness definitely. This is actually correct. There is special NS2 proprietary format for sample *.mwav. If you go through Slate's bank browser into "Instruments > Slate > Factory" or "Instruments > Slate > IAP" - you can see in some banks (for example Instruments > Slate > Factory > Single > A Kicks) that there is lot of samples with extension mwav instead of wav. Those samples containing multiple hits which are triggered exactly this random way I completely forget this, sorry for initial misinformation ..
For now this is closed proprietary format, but i'm sure it's Matt's plan to make it possible create such files using NS audio editor at some point . @dendy thanks for the info. So it looks as if this should be possible in the future without too much work. I think it would be really useful to expose this feature to the user, because with drums, especially acoustic drums, round-robin samples are essential to avoid that machine-gun effect. For the time being I can sequence drums in other apps that use round-robin samples (DrumPerfect Pro, iSpark, Auria's Lyra sample player etc) but I really like the sequencer in NS2 so ideally I would like to have the ability to use Slate to it's fullest potential. Maybe instead of a full, separate Round Robin UI it would be enough to be able to set the velocity view to "round robin" where it would even out the velocity map for all three layers and instead randomly choose one of the three to play. Would be nice and easy but comes at the expense of velocity mapping. Another minimal UI change idea: set two or pads to the same group and midi note. In that case, NS would cycle through them automagically. That would allow velocity mapping to remain. Or maybe a mash up of the above? If you could set a pad to any arbitrary velocity range (instead of always dividing up the full range), you could set Pad 1 to 0-65, Pad 2 to 66-104, etc. Set them to the same MIDI note and bob's yer uncle. Would allow the pad to be round robin (if set on the spit tab) and use separate sample sets for each velocity range. Still with minimal UI overhead. Is there any word from the developer on this? Obviously there is a workaround but it seems almost a shame we have 3 sample layering or velocity in Slate but no round robin. Personally i would like 8 sample round robin but 3 could suffice. Its just a bit of a hiccup to have to program different pads with different samples in every song. Obviously there are more important things to take care of first such as audio tracks and iphone integration but I am just curious if this is even a feature that is being considered. None of these things are deal breakers for me though so no biggie, just curious if any of these are being considered. On the same note is there a wishlist thread going yet or no? I remember one from NS1 days and while it did get a bit out of hand, I thought it was a good idea. Maybe a mod can start a locked thread with our wishes added to it? I do think an upvote system would be a good thing in that case (another old debate from NS1 forums).